To celebrate the Soil Association's Organic Beauty Week, I'm going to be bringing you an array of reviews and features all week long, showcasing some of the best organic based beauty brands currently on the market. 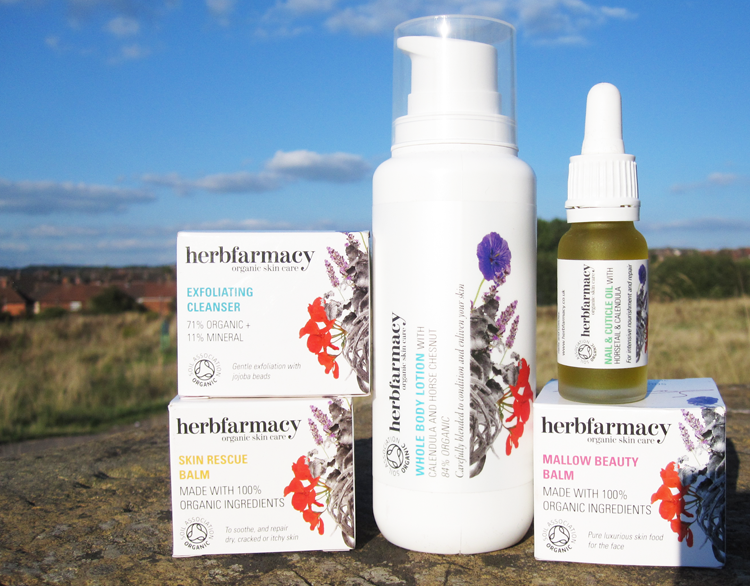 To kick things off today, I have a special spotlight on a wonderful British company called Herbfarmacy. If you suffer from dry and sensitive skin, then you need to try this body lotion. It's packed full of skin soothing ingredients such as Calendula, Horse Chestnut, Burdock, Marshmallow, Avocado, Vitamin E, and Evening Primrose Oil to name a few. It has a standard body lotion texture (not too thick but not too thin either) and feels rich and luxurious when you apply it, plus it sinks into the skin quickly and doesn't feel greasy or sticky. I've found that a little goes a long way with this, so I imagine the bottle will last a good time. It has a light, subtle scent of Lavender, Patchouli and Rose Geranium which I love too. My skin feels so soft and pampered after using this and it really helps to deeply hydrate my dry skin. My cuticles are prone to dryness, so I always use some kind of product to moisturise them to stop them from cracking or peeling. This product won the Best Organic Beauty Product in 2013's Natural and Organic Awards so I was excited to give it a go. The oil is a blend of Jojoba and Sunflower and features Calendula, Horsetail, Lavender and Lemon Myrtle to deeply hydrate, increase circulation and stimulate nail growth. I've been applying a drop or two before going to bed and my nails feel much stronger and less prone to breaking, and my cuticles are no longer dry - well worth checking out! A rich, white clay based exfoliator, this also has Marshmallow, Apricot Kernel Oil and tiny Jojoba Beads that provide the scrubbiness to remove excess sebum and impurities. Like the other products, because it's so concentrated you only need to use a small amount at a time so the jar will last absolutely ages. I've been using this 1-2 times a week and it leaves your skin looking refreshed and glowy every time. Impressed! 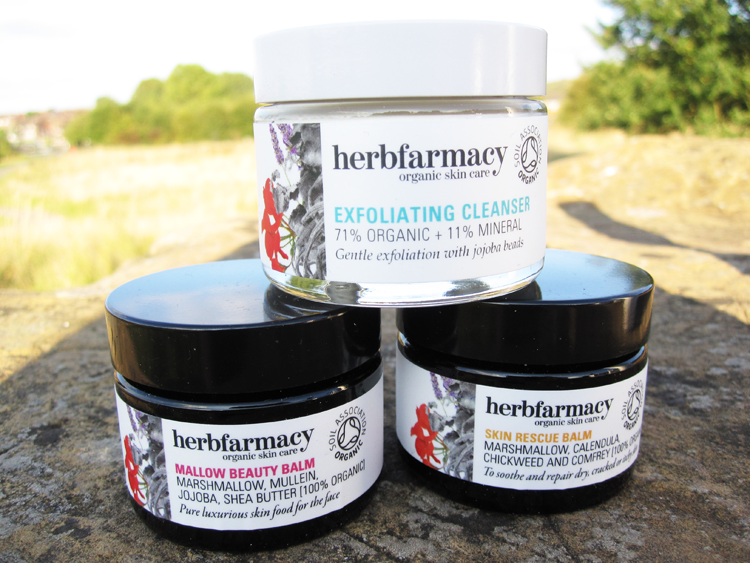 Probably the most famous product from Herbfarmacy is their award winning Mallow Beauty Balm. This jar of skin goodness is crammed full of Marshmallow and Muselin which is an infused oil that has anti-wrinkle properties. It's a seriously rich and luxurious face balm that you can use instead of your daily moisturiser or as a night time treatment on any fine lines and wrinkles. I do find this too heavy for my oily/combination skin to use on a daily basis, but as a once a week or fortnight hydrating treatment, it's amazing. Dry skins will drink this up! You guys all know how much I love a multi-purpose product, and this Rescue Balm is total saviour for any ounce of dry skin you have anywhere on your face, body, hands, feet, etc. The balm is super concentrated and thick, so again, the tiniest amount goes a very long way and it soon melts into the skin once you massage it in. It has lots of lovely ingredients such as Comfrey, Calendula, Beeswax, Shea Butter and Jojoba Oil to name a few, all of which help to soothe irritated and dry skin, whilst healing and repairing it.